Heavy rain fall on yesterday afternoon in Jakarta caused landslide on Jalan Pesona IX, RT 07/05, Kalisari Urban Village, Pasar Rebo, East Jakarta. Currently, road can't be accessed due to this incident.
" No one injured, our stuffs are also safe. But two motorcycles are still buried due to landslide"
Based on collected information, landslide happened while heavy rain falls around 16.50 PM. Residents were startled by rumble sound because Jalan Pesona IX as wide as three meters was slid down. The road was immediately buried by soil materials until the road is completely cut off. Suwuk connecting channel was also clogged by debris. 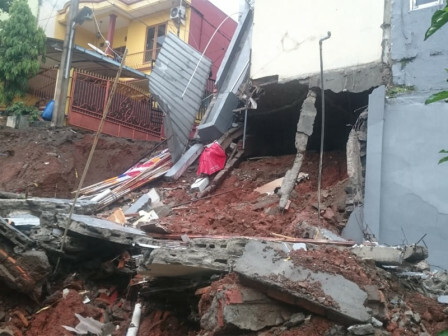 Due to this incident, RT 07/05 Head, Sarifudin's house is damaged and two of his motorcycles are also buried by landslide. According to monitoring on the field, landslide occurred on the edge of Suwuk connecting channel. Jalan Pesone IX is a blind alley. Sarifudin's house is located on the end of this alley, right on a four meter high cliff. He conveyed, his two children and himself are not on the location when this incident occurred. There are only his wife and household assistant. "No one injured, our stuffs are also safe. But two motorcycles are still buried due to landslide," he stated, Monday (11/26) night.